Whilst the No Poreblem Primer is brilliant for textured or porous skin, the Feel Like Honey Moon Skin Base is ideal for dry, dull skin. It can be a little but messy to use as it has a spatula applicator and the texture of honey but the hydrating and illuminating effects are worth it! This primer is infused with gold flakes, which add to the brightening effects and a little goes a long way with this product - in fact, I find that if I use too much, my base doesn't sit evenly on top. I use the spatula to apply some product to my fingertips and then I pat it into my skin and allowing it to settle before applying my foundation. Flawless Skin Top Coat is a unique product because it's a primer, BB cream, foundation and primer in one. It has a lightweight texture and gives light coverage with a glowy finish that isn't overly dewy. It's the perfect everyday base because it gives a fresh look to the skin and blends seamlessly. It's not one for full coverage lovers but for me, it's perfect! I find that it lasts a good 8 hours on my skin before it needs touching up. 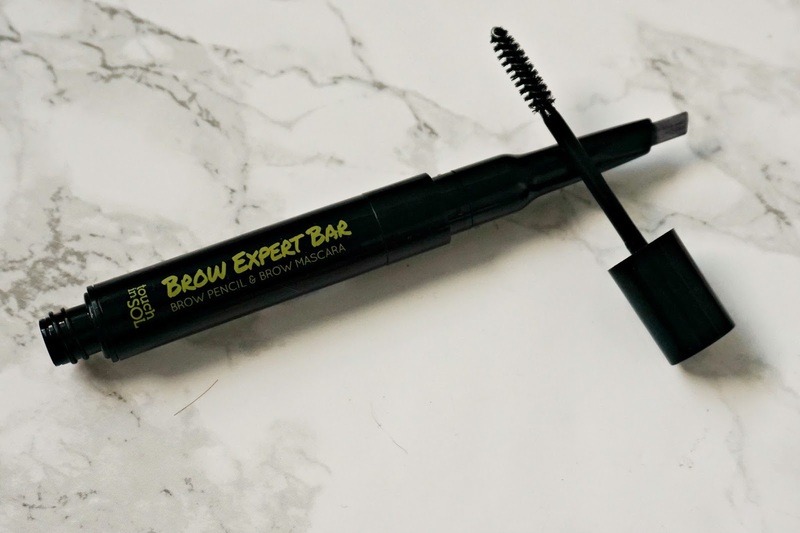 Touch In Sol have three brow products and the one I've tried is Brow Expert Bar. It's a double-ended product with an angled, retractable pencil at one end and a clear brow mascara at the other. The pencil is very similar to Anastasia Beverly Hills Brow Definer, which I love because it's so quick and easy to achieve defined brows with it and the brow mascara ensures that they stay in place. The texture of the pencil is the perfect balance between stiff and soft - not so soft that it will smudge but not so stiff that it will break when using it! The real stars of the show for me are the Metallist Shadow Liquid Foil & Glitter Duos. Like the name suggests, these are duo shadows - on one end there are metallic cream shadows, which are the perfect base for the glitters on the other end or the cream can be worn alone for a quick, easy eye look. Even on my oily lids, these shadows last a good 9 hours without creasing or fading and the glitter is forgiving on my not-as-firm-as-they-used-to-be lids! They are extremely pigmented and the glitter can be a little messy to use, so I apply some to my hand and then dab it on either with my finger or a flat shader brush - that way there is no fall down at all. If you like the Stila Magnificent Metal shadows then you will LOVE these or if you think the Stila ones are too pricey, then you need to try these and they are more versatile as you can use the cream shadow alone. 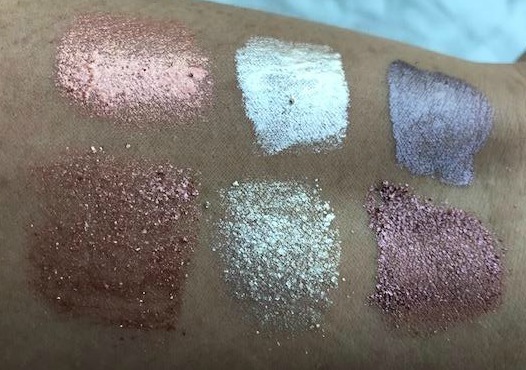 There are five colour combinations available and I have three: Lottie (mauve-taupe metallic cream and rose gold shimmer), Margaret (both ends are vivid copper) and Talia (champagne-gold cream shimmer and pale gold glitter). I'm not usually a fan of fibre mascaras because I have sensitive eyes and find that the bits of fibre usually irritate me, however I can see the attraction as they do add volume, however Paper Pusher Stretch Fibre Lengthening Mascara is different from others I have tried because rather than trying to add volume to my lashes, it adds length and the fibres aren't as loose as with others I've tried so I've had no issues with them falling into my eyes. It adds length and definition but I prefer volume so I combine it with another mascara so that I get length and volume to give me the dramatic lashes I love. 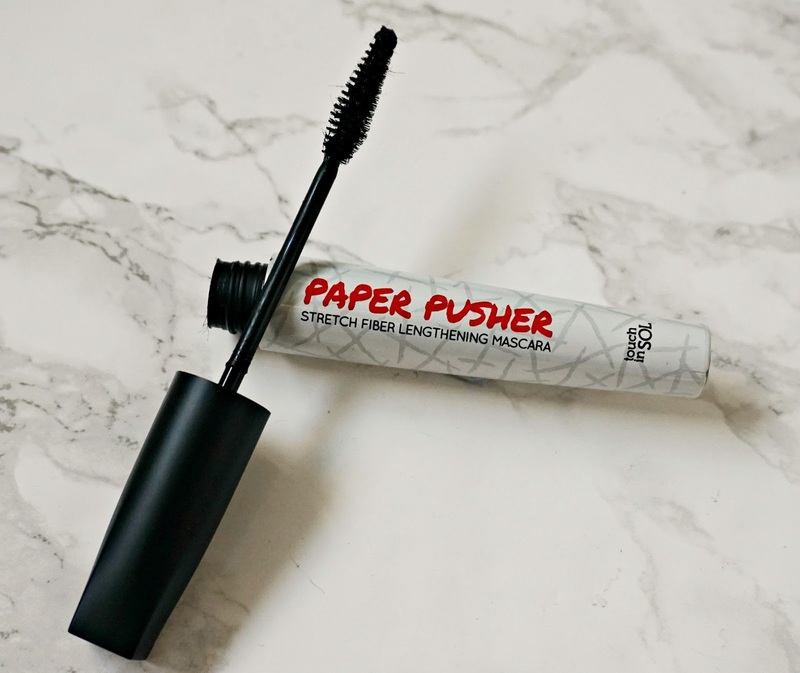 It is really black and doesn't make my lashes crispy, smudge or flake so if length is what you look for in a mascara, I would highly recommend giving it a go! Finally, I have tried one lip product and that is a Go Extreme High Definition Lip Lacquer in the shade #06 Earl Grey. 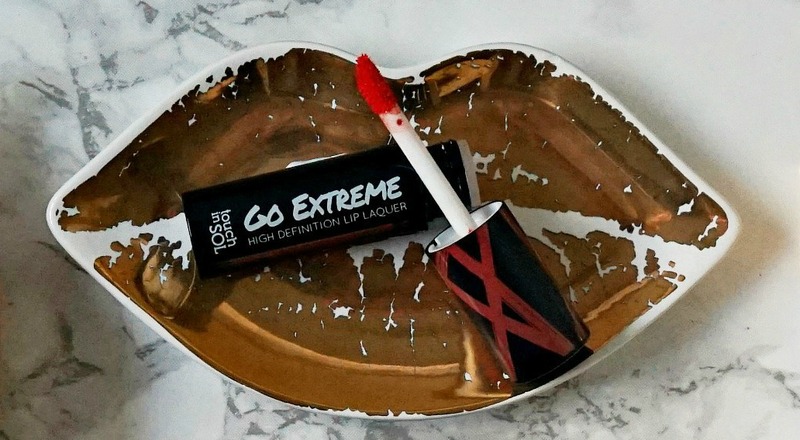 It is as pigmented as a lipstick, however with the finish of a lip gloss and the lasting power of a liquid lipstick, making it pretty unique. The small doe-foot applicator means that I can achieve precise application and although the formula is very moisturising, I don't find that it slides over my lips. This particular shade is more suited to summer so I know I will get a lot of wear out of it then, however the formula is perfect for this time of year as it is so moisturising due to the 70/30 water/oil ratio. 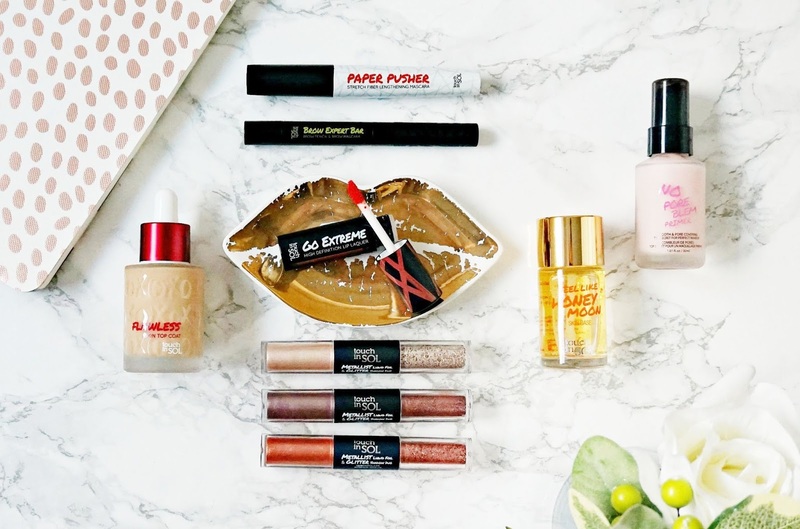 Overall, this brand has seriously impressed me and I cannot wait to try even more products. Like I said previously, the quality is high end but without the high price tag to match. If you are unsure where to start, I don't think you can go wrong with the No Poreblem Primer or Metallist Shadows and then explore further from there. Have you tried any Touch In Sol products or do you like the look and sound of any of these? I'd love to hear! Available from Cult Beauty and ASOS. All products are bought by me, unless otherwise stated. I bought the Poreblem primer but all other products were kindly sent to me. This is not a sponsored post. Opinion is always my own.